Toyota Motor North America Inc. celebrated the official opening of its new North American headquarters in Plano, Texas, with a gala event attended by dignitaries, partners and community leaders who had the first glimpse of Toyota's new corporate campus that reaffirms the company's longstanding commitment to the United States. • 136,000 direct and dealer employees. The company will have jobs for up to 4,000 Toyota team members in Plano. In addition to the employees who chose to relocate, Toyota previously announced that it would hire more than 1,000 new team members from the rich mix of local talent and elsewhere. More than 90 percent of the company's new hires from the past year for positions in Plano have come from the North Texas market. Toyota has already filled more than 75 percent of its open positions. The new campus supports the company's One Toyota vision with spaces that intentionally create and foster a transparent environment, encourage the fun of discovery, and make Toyota a place where people want to come to collaborate and innovate. Among the seven buildings is a large central courtyard that serves as the literal and symbolic heart of all social and business functions – including dining, fitness, and conferencing facilities. • a rainwater harvesting system, up to 400,000 gal., to use in irrigation. 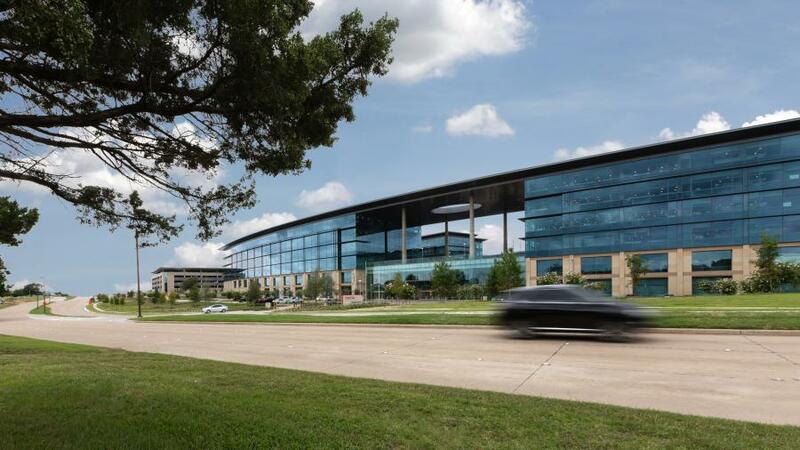 Professionals who led this project include a host of Dallas-based firms: KDC Real Estate Development & Investments to develop and build the campus, architect Corgan Associates to design the campus, and Austin Commercial to manage the construction. Also, commercial real estate firm JLL was the tenant representative. Construction at the campus included the pouring of more than 142,500 yds. of concrete; installation of more than 12 acres of glass; and enough Texas limestone to equal the weight of 340 Texas-built Toyota Tundra 1794 Edition trucks. At its peak, there were approximately 2,000 workers on site daily, putting in more than five million hours of work on the project. To mark the occasion of the opening, the company is holding a special celebration for more than 300 guests. Speakers included Jim Lentz, Plano Mayor Harry LaRosiliere, and other Toyota and other local government representatives. Guests were welcomed with a musical performance by the local Plano Symphony, performance by vertical dance group pioneers, Bandaloop; as well as a fine dining experience from noted celebrity Chef Dean Fearing. Tours of the new campus were provided as part of the evening's activities. For more information, visit toyotanewsroom.com.